Hello friends! 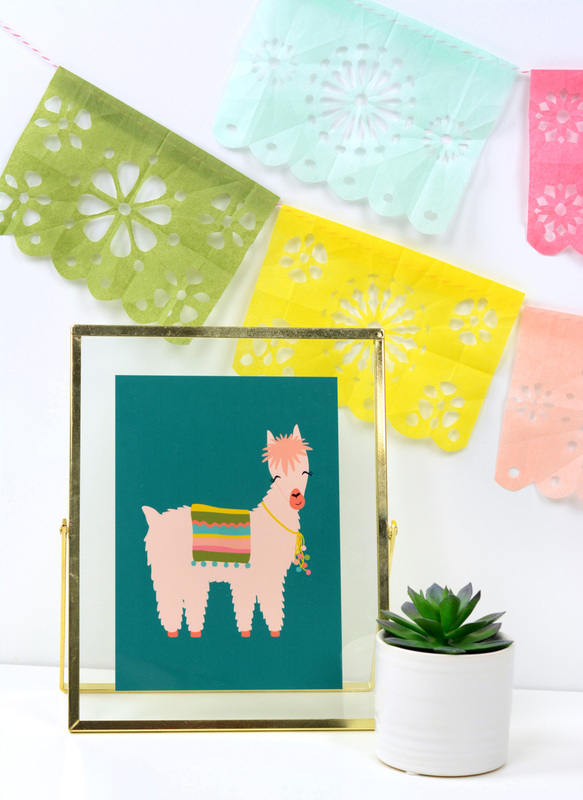 It’s Amy Robison here to teach you how you can create this fun and simple Cinco De Mayo fiesta banner, or as it is also known, papel picado. 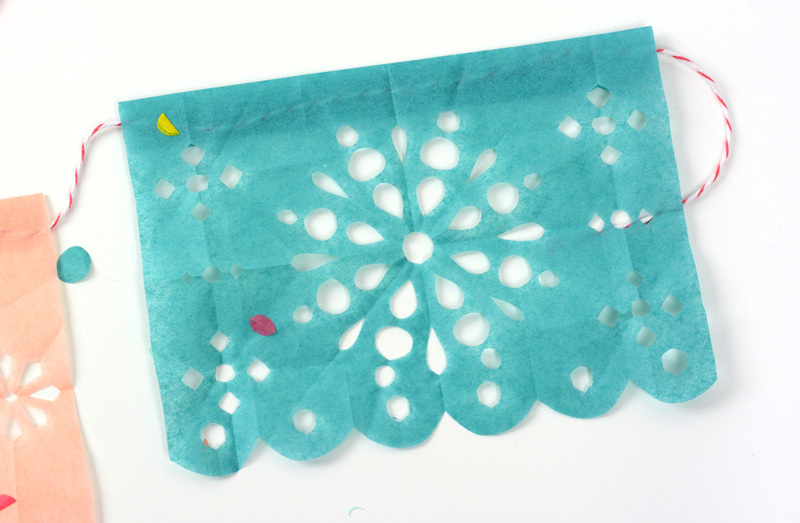 When you think of a fiesta, I’m sure you picture these beautiful, intricate banners that are strung for decorations. They’re bold and vibrant colors make every party look like an absolute blast. I was always a bit intimidated to tackle a banner project of that size and detail, but I’m happy to be sharing with you the easiest and fastest way to hand cut your own. Plus, it is very inexpensive. That is always a major bonus in my book when hosting any party! These can be made any size you need by following the same folding instructions. 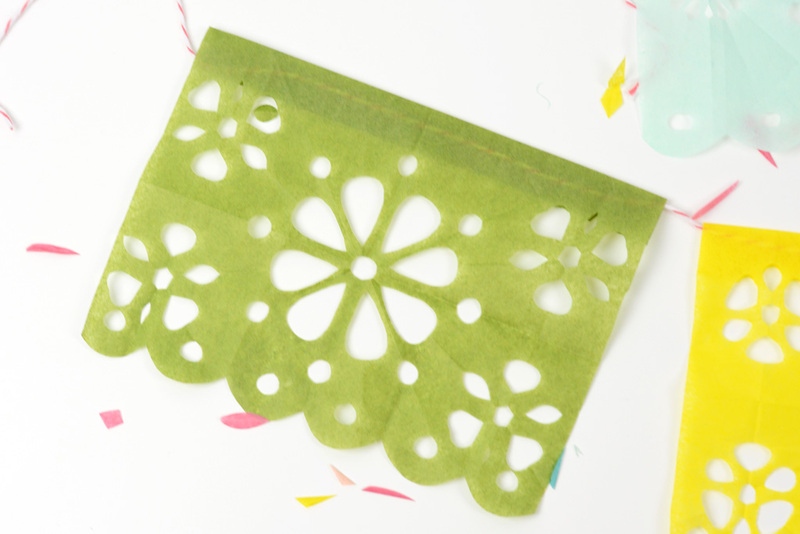 I love the creative possibilities with cutting papel picado. You can use a wide variety of colors and sizes to make it work for many parties. Cut a few over-sized panels to hang as the backdrop of a photo booth, or attach tiny banners to a party favor bag or even straws? Use single panels as placemats at the table. 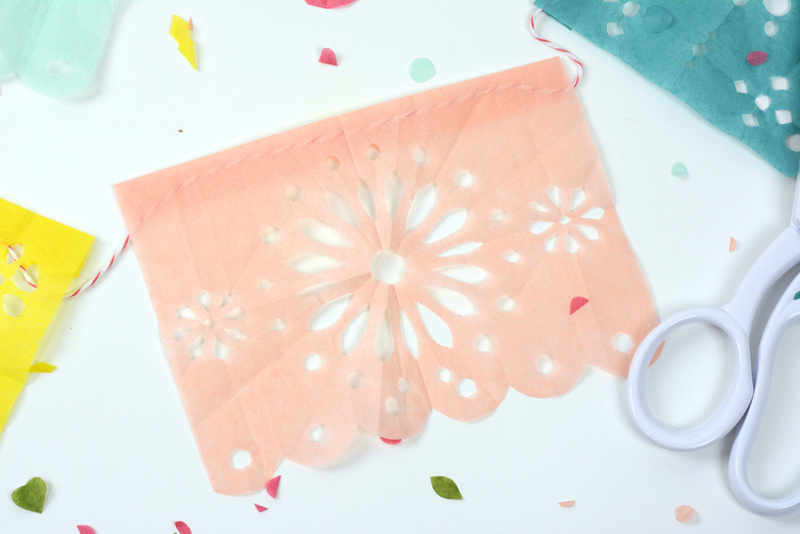 The tiny pieces cut out of each tissue paper sheet can be used as confetti to sprinkle on the table. 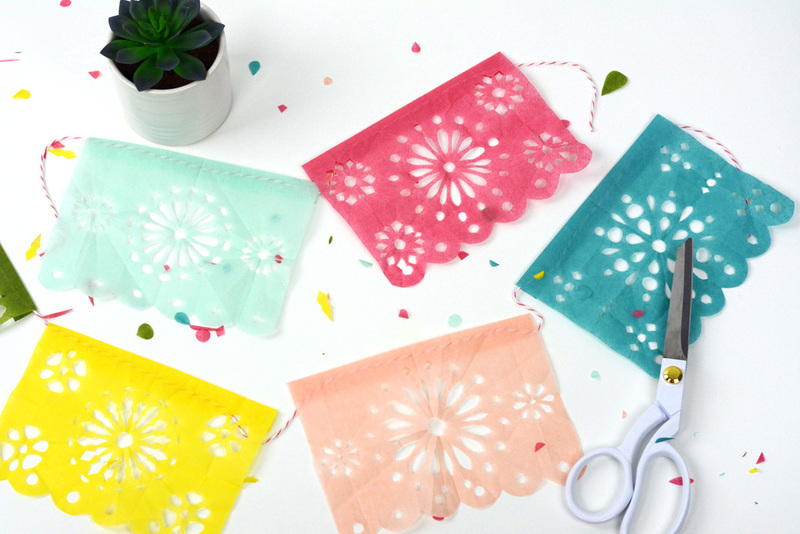 Another great way to use papel picado is to cut them out of white tissue paper and hang at a wedding. These banners are especially beautiful at outdoor parties and events where you can see them dance across the sky. Each banner only requires a few simple supplies and a couple of minutes. It really is that easy. I have included a supply list below with a link to where you can purchase tissue paper in a huge variety of colors. 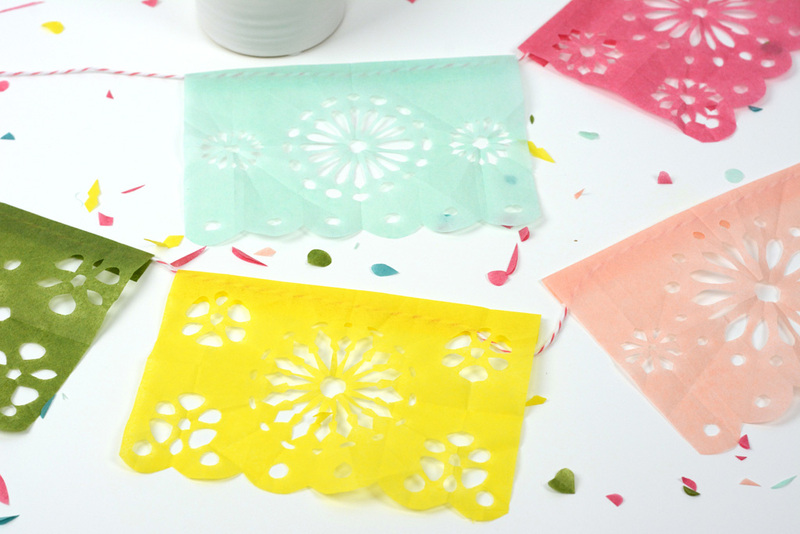 The Cinco De Mayo fiesta banners are so easy to make, but they are a bit tricky to explain through pictures and text. I decided to make a video tutorial for you that will be much easier for you to follow along. You can view it below, or on my YouTube channel where you can find more video tutorials for other fun parties and crafts. Here are a few samples of designs I did to help get those creative juices flowing so you can create your own. I love mixing and adding a variety of the folding patterns to get designs cut in different places on each panel of the banner. Here I chose to stick with simple floral designs, but you can get as intricate and detailed as your tiny scissors can cut. It is always so fun when people show me projects they have created using my designs or tutorials. 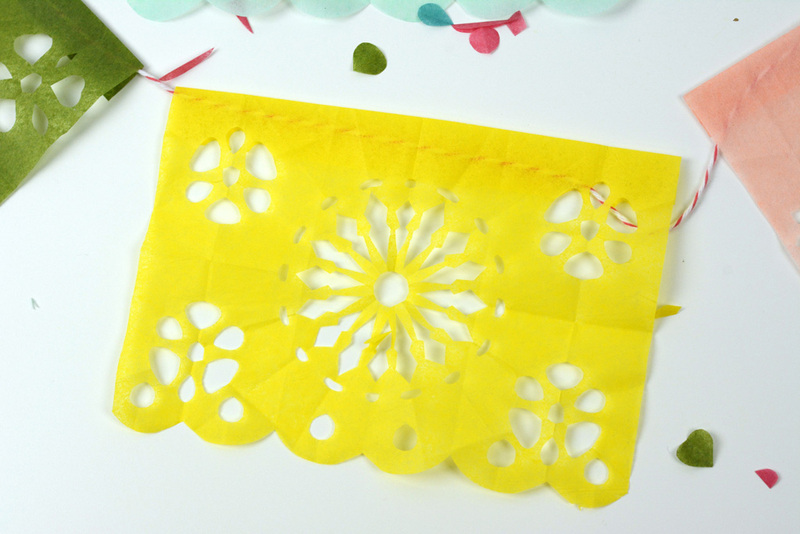 If you make a papel picado using this simple tutorial, I would love to see it! Tag me in your Instagram photos so I can check it out and see how amazing they turned out.